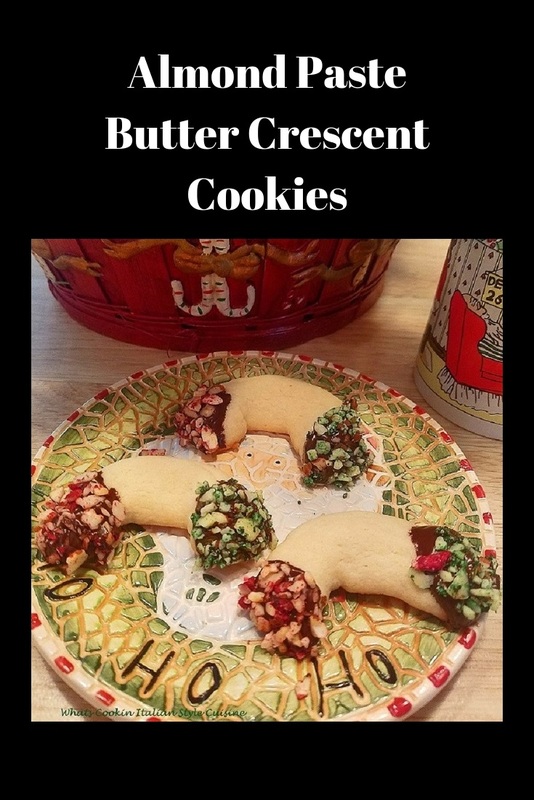 These buttery almond butter crescent cookies can be shaped to whatever you like! The dough is so easy to work with. 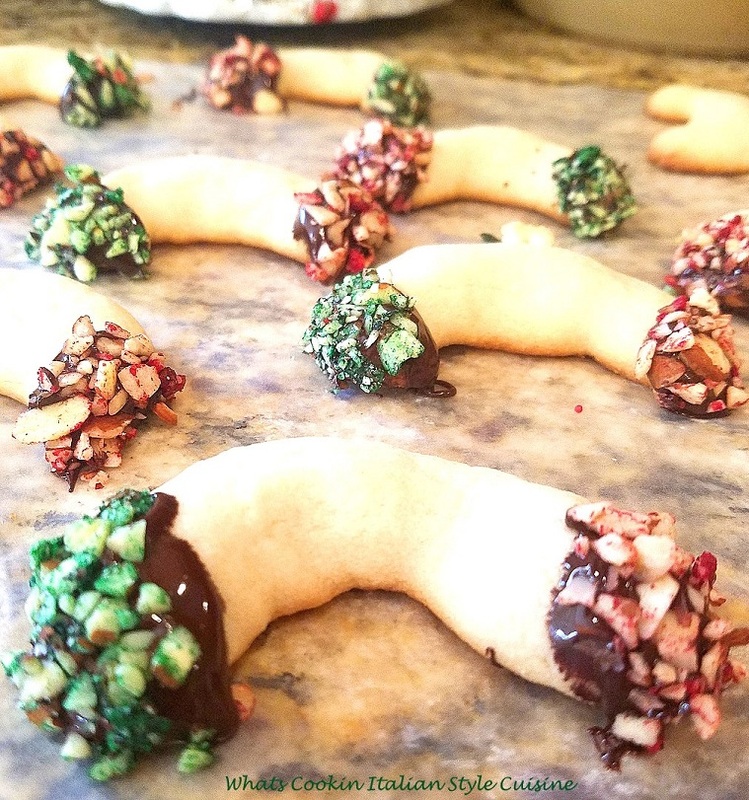 The fudgy chocolate on each end dipped in nuts just make these crescent cookie so festive for your Christmas tray. 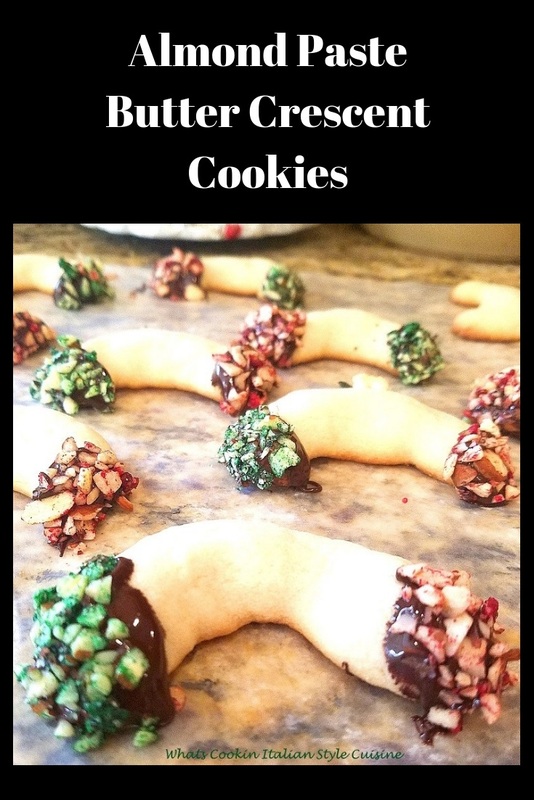 This was one of our families all time favorite cookies that we made every year. 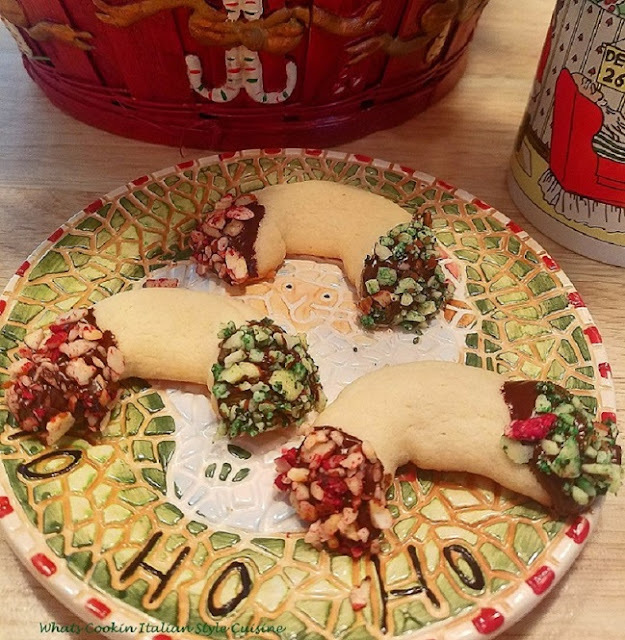 The recipe is easy to follow and worth the extra efforts decorating them to make a beautiful addition to your cookies trays! 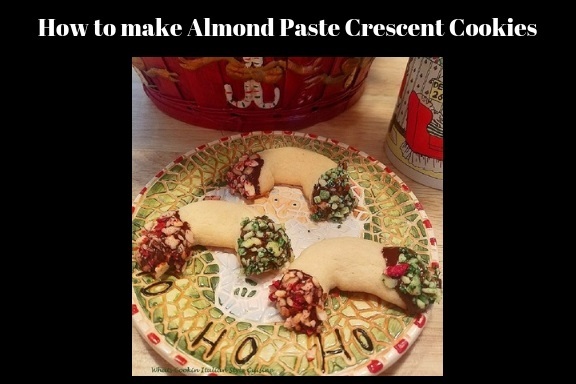 Scroll down to check out this easy recipe along with some links showing how to make almond paste. In our family, we have made these rich and dense almond paste cookies for years from homemade almond paste. The homemade almond paste is very easy to make and less expensive than buying it. Mom also made a very light version of Almond paste cookies, with egg whites, found in most Italian cafes that we also love, often found on Italian Wedding trays. 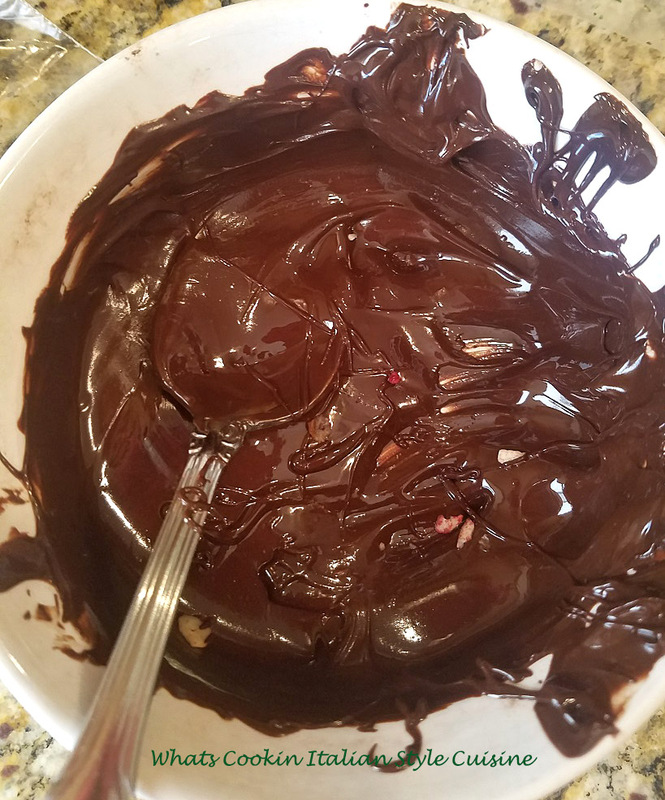 It's great to dip the ends into chocolate and then any holiday theme color. These almonds were crushed and dyed with food coloring for the Christmas holiday! I love almond paste in cookies, it really makes the cookies moist and delicious. These are so pretty and perfect for the Christmas holiday. Mom would always shape these in stick, crescents or S shapes and even round wreaths. We also make an Italian S-shaped cookie that's a completely different cookie with frosting. These are a thicker chewy cookie that is perfect with espresso and rich in almond flavoring. I also love dipping them in colored nuts, they are so festive. If you have nut allergies and like coconut, you can also tint the coconut. Other alternatives would be to use seeds, like pumpkin or ground sunflower seeds. Always use a good grade chocolate for dipping. The chocolate really enhances the flavor of the almond paste in these cookies. You really can ruin a cookie by buying a less expensive chocolate that won't melt and is not real chocolate. Self Rising Flour Do it yourself! 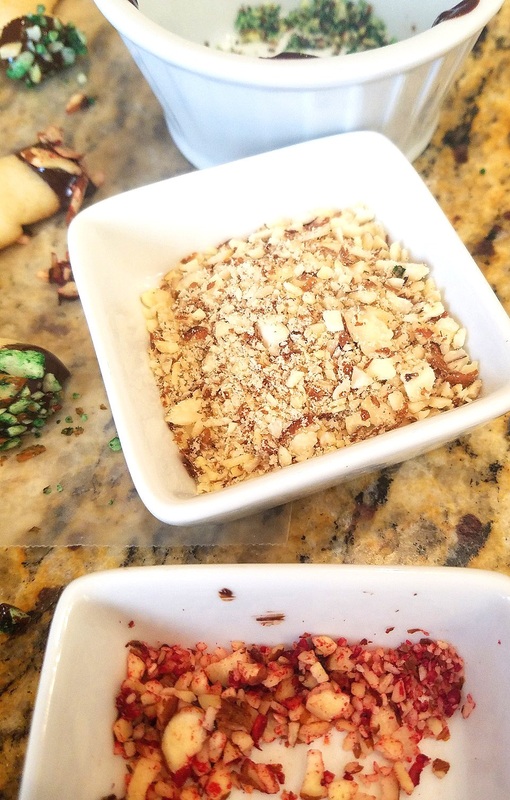 2 cups chopped almonds, pistachios (or other nuts) divided, you can also use seeds of any kinds, coconut or other sprinkles you prefer for nut allergies. Preheat oven to 375 degrees. Line cookie sheets with parchment paper or grease. Cream the butter and the sugar together until light and fluffy. Add the almond paste, vanilla, egg until well blended. Slowly add the flour, baking powder and salt until smooth. You can now make crescent shapes, wreaths, candy canes or any other shapes you desire. Dye the almonds 1 cup of red 1 cup of green. I put mine in the food processor with 3 drops of coloring. Place in a bowl and set aside. Bake for 12 minutes or until edges begins to get golden brown. Melt the chocolate and set aside until cookies are cooled completely. Dip each cookie end in melted chocolate, then in red crushed tinted almonds on one side and green crushed tinted almonds on the other or use colored candies of your choice. Place on parchment paper or wax paper and let dry for at least an hour. Don't Forget to Try Homemade Almond Paste! 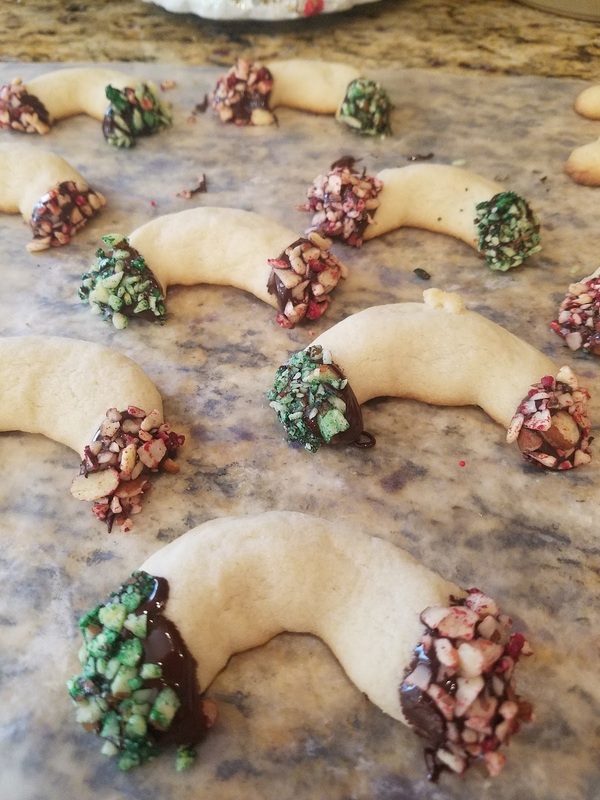 The Crescent cookies look wonderful! These are beautiful, Claudia! I love how you dyed the almonds to make them extra festive!! !